In this Part we will explore the meaning of the 23rd Shloka of Sri Vishnu Sahasranamam. Bhagavan is the best amongst the Gurus and His abode is the ultimate destination for his devotees. He is the truth that his devotees seek and He is well disposed towards his devotees. He exemplifies true valour. He does not have to open his eyes to see the world as He is forever awake and watching all events. He is adorned with the special garland (Vaijayanti). He is the Lord of Speech with vast knowledge and magnificent intellect. Sri Adi Sankara considers Gurur and GuruTamah as two different Namas but Sri Parasara Bhattar considers them as one Nama viz. Gurur Gurutamah. Interestingly, Sri Parasara Bhattar considers ‘Vaaachaspatih’ and ‘Udaaradheeh’ as two separate Namas while Sri Adi Sankara considers them as one Nama. However, the overall name count is not affected because of this.Sri Parasar Bhattar takes Gurur Gurutamah as a single compound name as noted above and interprets the phrase ‘Guru-Tamah’ as an adjective for guru, i.e., the guru who is the best of all gurus. Guru means ‘spiritual preceptor’ and tamah is a superlative, meaning the best. In Sanskrit the addition of ‘tama’ to the end of the word makes it the superlative degree. Thus Gurutamah means the highest or the foremost among all preceptors. Sri Adi Sankara views this as two Namas, Guru and Guru-tama. He interprets the Nama ‘Guru’ in two different senses, one as the great teacher and the other as the Universal father. He says ‘Sarva vidyaanaam upadeshtrutvaat sarveshaam janakatvaat vaa – He is called Guruh because he is the great spiritual teacher of all knowledge and also because He is the father or creator of the Universe. He justifies this by saying ‘Virinchyaadeenaam api Bramhavidyaa Sampradaayakatvaat Gurutamah – He teaches the Knowledge about the Bramhan to Bramha himself’. This idea is mirrored in Svetaashvatara Upanishad (6.18) which says ‘Yo Bramhaanam vidadhaati poorvam yo vai vedaanshcha prahinoti tasmai- He who brought Bramha into existence and imparted the Veda to him’. In a similar vein Maha Narayana Upanishad (8.15) says ‘Guruh ka iti | guruh Saakshaad-Adinarayanah – The Ultimate Guru is Shri Aadi Narayana’. The beginning of Guru-Shisya parampara is believed to have commenced with Nara and Narayana. In Dharma Chakram, the writer says that He is Guru-tamah because he pervades everything and is everywhere, and all we need to do to get His teachings, is for us to yearn for it. 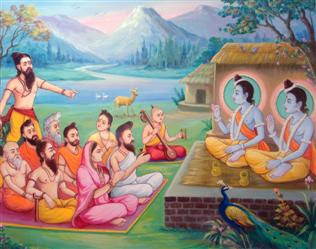 All that is needed is the quest for His benevolence in order to make progress towards attaining true knowledge (gnana). The Abode of all desired things. Dhaama first appeared as ‘Tri-kakud-Dhama’ as Nama 62. Some of the same interpretations apply here too. Sri Bhattar interprets this Nama by linking it with the previous Nama and refers to the Matsya Avataar. He points out that Bhagavan is Dhaama because He is like the helmsman who steers the boat carrying the seeds of all the transitory moving and non-moving objects at the time of Pralaya. Sri Sankara interprets the Nama as being the Supreme Leading Light. According to him this meaning is appropriate as Narayana Suktam says ‘Narayana Paro Jyotih – Narayana is the ultimate light’. Sri RamanujAcharya in his Gita Bhashyam (Chapter 10 verse 12) says Param Brahma Param Dhaama, chooses the meaning “Supreme Light” for the word dhAma – dhAma Sabdo jyotirvacanah – param jyotih. The writer in Dharma Chakram elaborates further on the term “Supreme Light”. The eye sees with the light from the Sun. But neither the Sun’s light nor the eye can see the Ultimate. For that one needs the light called Bhagavan’s grace, the Inner Light. 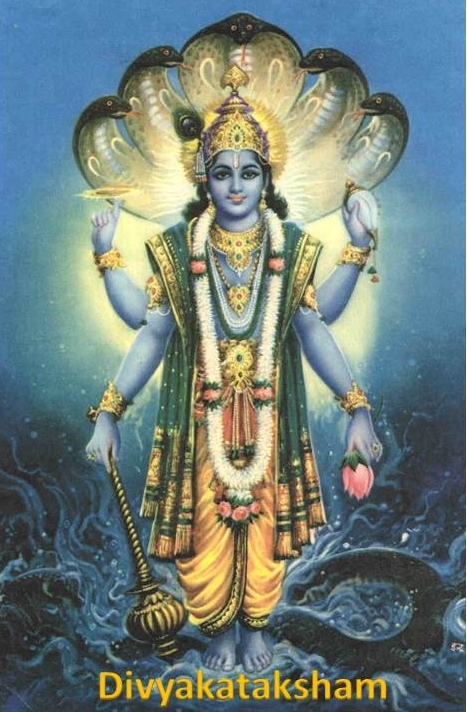 This is what Maha Vishnu is, Dhaama the Supreme Light, which can reveal what no other light can. It is the eye of intense desire to reach Him that can see this light, and no other eye can. He is the Abode for all karmas, etc. Sw ami ChinmayAnanda, in addition to the interpretation of “Supreme Light”, gives the alternate interpretation that He is Dhaama because He is the Ultimate Goal (Dhaama or peak). Incidentally, the reference to Char Dham (literally: ‘the four abodes/seats) are the names of four pilgrimage sites in India that are widely revered by Hindus. These are Badrinath, Dwarka, Rameswaram and Jagannath Puri. It is considered highly sacred by Hindus to visit the Char Dham during one’s lifetime. He is the pure Truth. He is made of Prana, Matter and Sun. He is well disposed towards the noble souls. He is ever the same in the Past, Present and Future. Sri Parasara Bhattar points out that He is Satyah because He was good to Sat-Purushas such as Manu who sought His help at that time. Sri Adi Sankara summarises this all by saying ‘Satyasya Satyam – He is the Truth behind all Truth’. Satyah is One who is ‘excellent’ in Sat, based on the Panini Sutra 4.4.98. Sri Satyadevo Vasishtha refers us to the Bhagavad Gita (Chapter 17 Verses 26 and 27) for a definition of ‘Sat’ in Lord Krishna’s words. Meaning: The word ‘Sat’ thus refers to existence, goodness, good acts, firmness in sacrifice, austerities, gifts, or any acts for such purposes. One who is excellent in all these, or One who is excellent to (i.e., supports) those who do acts along these lines, is Satyah. Paraakram means valour. So Satyaparaakramah is one with true valour. In Adi Sankara’s words ‘Satyah avitathah paraakramo yasya sah – one whose valour is true and unimpeded’. 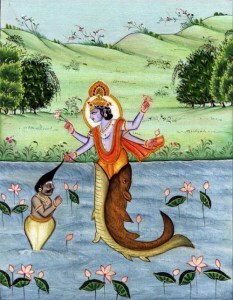 Sri Parasara Bhattar, continuing on his interpretation of this sequence of Namas in terms of Matsya Avataar, gives the example of Bhagavan performing truthfully the courageous acts towards Manu and others. The writer in Dharma Chakram points out that there can be two kinds of valour, one which is used for the good of the people, such as that of Sri Rama, and the other that is used for demonstrating power and for hurting others, such as that of demon Ravana. Meditating on Maha Vishnu gives us the ability to develop the valour of the right kind. The Vedas, with the aid of which, BRAHMA, performs his role, happened to slip out of his possession at a moment of his respite. An Asura by the name Hayagriva (not to be confused with the Hayagreeva Avataar of MahaVishnu) who was alert observed it and instantly devoured them. But, Vishnu, the preserver-God, was watching this. Since Pralaya or the Dissolution – was to follow soon, the Vedas would be lost for the next spell of Creation, unless they were retrieved. Bhagavan was wondering what was to be done, he noticed King Satyavrata (aka Vaivasvata Manu), was doing penance subsisting in a river, making the ritual offering of water to Sun God. 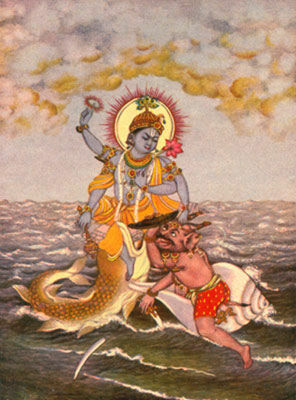 The Lord immediately assumed the form of a fish or Matsya. 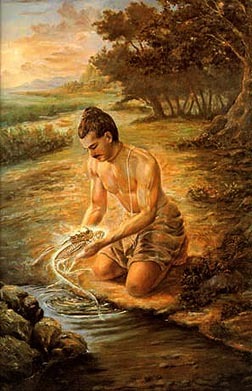 As King Satyavrata scooped water from the flowing river, he sighted a tiny fish in the water he had scooped. When he tried to put it back into the river, the fish pleaded with the King not to do so as it would be eaten up by the big fish in the river. King Satyavrata took pity and took it into his Kamandalam (earthen or metal water pot with a spout used by ascetics) and went back to his hermitage. Overnight, the Fish grew too big to be in the Kamandalu. The next morning when the King went to look, the fish requested him to remove him to a larger vessel. King Satyavarta did so but soon the fish became too big for the larger vessel also. Addressing the King, the fish said that he should protect him and find a suitable living space for it. King Satyavarta then emptied the vessel into a large pond near the Palace along with the Fish. But, in no time the fish grew as large as the pond and filled it. Then the Fish exhorted the King to take it to a large and deep lake. Although King Satyavrata took it to several lakes, one larger than the other, the fish kept growing bigger and bigger. It went on asking for larger and larger living space. 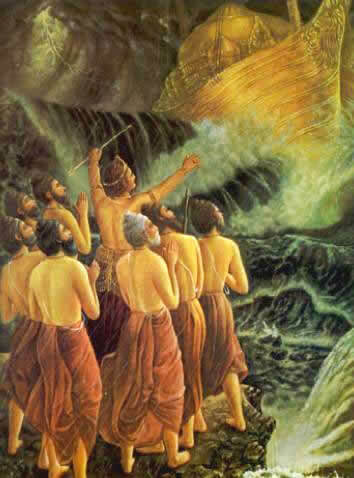 Satyavrata became exasperated and decided to put it into the Ocean. While he reached the Ocean, the Fish addressed him thus: “O’ King, do not put me into the ocean, I am sure to be swallowed by the gigantic creatures there.” Satyavrata became suspicious now. He was despairing to know how a fish could grow as big as the largest lake in a matter of days. He then realised that it was Lord Vishnu in the form of a fish. 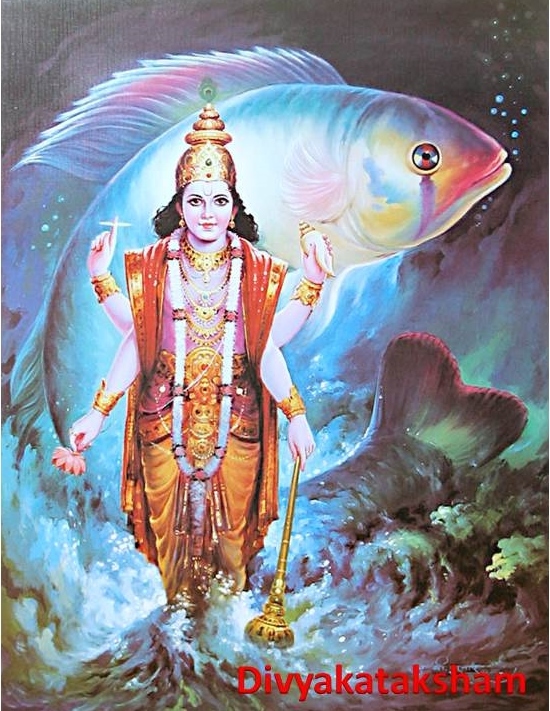 Satyavrata immediately prostrated before the Fish and prayed to be told why God had appeared in the form of a Fish. The Lord told his devotee, “Just a week from now, the Ocean will rise and inundate the entire Universe for the dissolution of creation. At that time you will see a spacious boat approaching you. Do collect all the seeds, plants and animals required for the next spell of creation and get into the boat and await me. Take VASUKI, the King of Serpents, also with you. The Saptha Rishis (The Seven Sages) will accompany you”. The Fish left for fulfilling its mission of retrieving the Vedas. 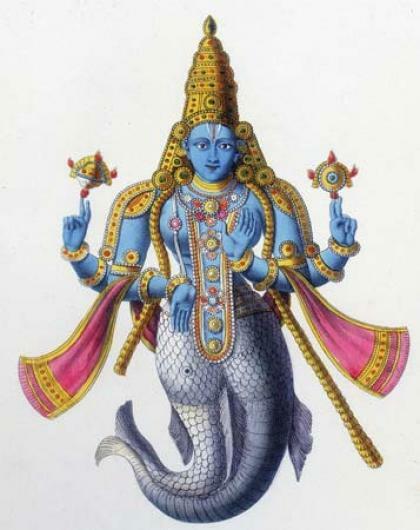 The Hayagriva Asura (not to be confused with the Hayagreeva avatar of MaahaVishnu) saw the gigantic fish approaching him and was overtaken by fear. He held the VEDAS tightly in his mouth. But soon the Divine Fish slew him and recovered the VEDAS and restored them to BRAHMA for him to resume the function of CREATION at the appropriate time. As foretold by the MATSYA, PRALAYA (deluge) set in and on the turbulent waters, a boat appeared. King Satyavrata, the Saptha Rishis and all the living creatures found haven in the boat. 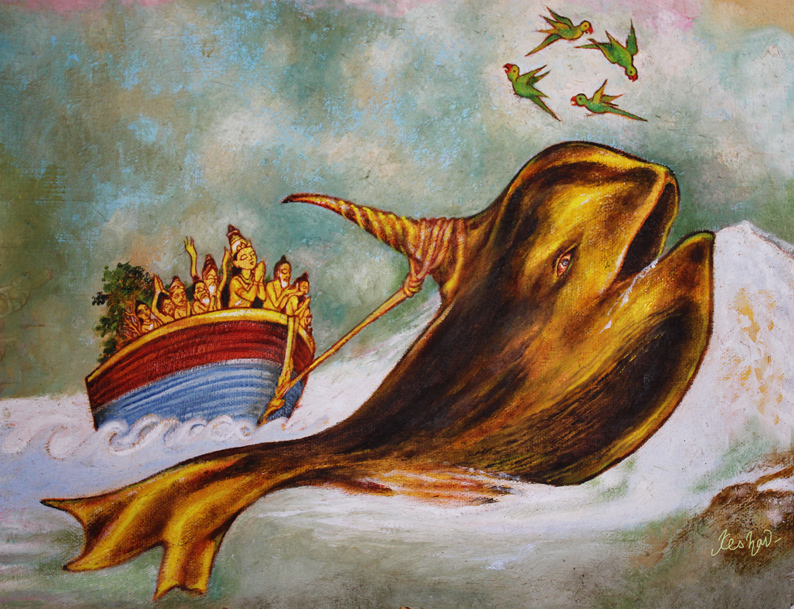 The Golden coloured Fish appeared with a horn and ordered that the boat be tied to its horn using VASUKI as rope. While the boat floated safely on the rising and enveloping waters, Lord Vishnu taught the Rishis the highest form of Truth. This collection of truth has come to us in the form of The Matsya Purana. 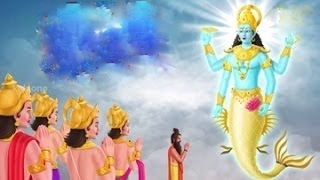 Lord Vishnu in this manner saved his devotees from dissolution so as to hand down divine knowledge and saved the Vedas from destruction so as to ensure the next Creation after the Dissolution. After the great Deluge, Manu’s family and the seven sages repopulated the earth. According to Adi Sankara this means ‘Nimeelite yato netre yoganidraa ratasya ato Nimishah – His eyes are closed in Yoganidraa or Yogic slumber hence he is called Nimishah’. Sri Parasara Bhattar interprets this as ‘Na Eekshate iti nimishah. His Graceful Sight does not fall on those who are opposed to Him or His devotees’. Shri Radhakrishna Shastri points out that He is Nimisha (with closed eyes) because He does not need His eyes to see. The Dharma Chakram writer points out that He with his closed eyes is seeing all because He is everywhere, in every one of us, all the time, and is watching all that happens everywhere even without eyes. Those who contemplate on the Yoga-Nidra of Vishnu can close their eyes and meditate, and over a period of time, will be able to focus their minds towards Him in that state (normally, whether our eyes are open or closed, they wander in worldly thoughts!). Sri Bhattar interprets this Nama in terms of the Matsya or the Celestial Fish incarnation. In this incarnation, He never closes His eyes and is ever-watchful of His devotees (Fish do not have eyelids, and so never close their eyes). Sri Adi Sankara gives two additional explanations – He is ever awake because of His wisdom, or He is Aatma svaroopa, and Aatma never sleeps. He says ‘Nitya Prabuddha svaroopatvaat Animishah Matsyaroopatayaa vaa Aatmaroopatayaa vaa Animishah’. One is reminded of ThiruppanAzhwar’s concluding Pasuram in AmalanAdipiran “en amudinaik kanda kangaL matrondrinaik kaanaave”. While the Azhwar sang this when he was describing the beauty of the Lord in the temple, the statement aptly applies to the inner eyes as well. The Dharma Chakram author gives the significance of this name as indicating that one who meditates on this name will be always spiritually awake, and bad thoughts and the worldly distractions will never enter his mind. The word Srag denotes a garland. Sragvee is one who is constantly adorned by a garland. According to Panini’s Ashtadhyayi 5.2.121 – as Maya medhaa srajo vinih – the affix ‘Vin’ coming after Sraj indicates ‘in association with’. So here the meaning is ‘One who is always adorned with garland – denoting the Vaijayanti garland of Sri MahaVishnu. 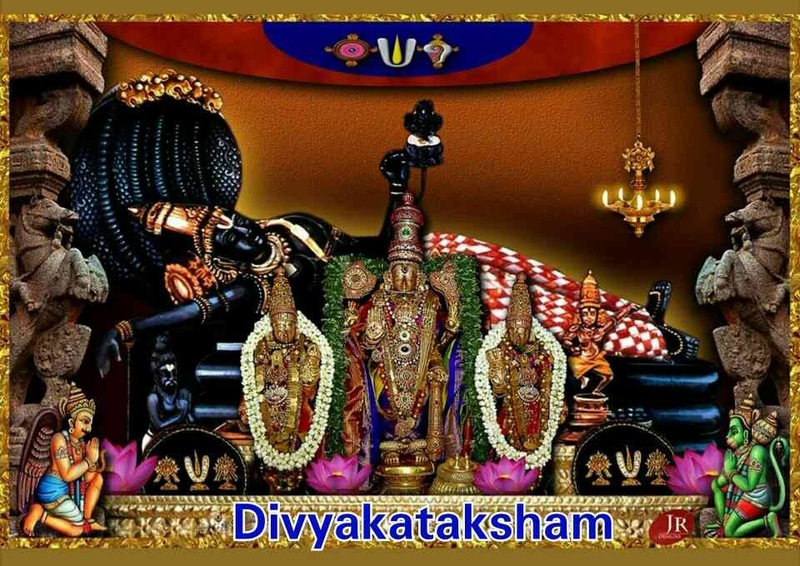 Sri Adi Sankara says ‘Bhoota tanmaatra roopaam Vaijayantyaakhyaam srajam nityam bibharti iti Sragvee – He is called Sragvee because He is always wearing the garland called Vaijayanti which represents the five basic elements (taste, sight, sound, smell, and sensation) of the Tanmatras. Sa bhuta hetu sangaataa bhuta Mala ca vai dvijah || (1.2.72). Sri Satyadevo Vasishtha derives the meaning starting from ‘srij’ meaning ‘to create or set forth’. Since all creations such as the Stars, Sun, etc., are His creations, He is Sragvee. In a garland, there may be different kinds of flowers, but they lose their identity as soon as they are part of the garland. So also, all these different creations are together like the Sragvee or Bhagavan Vishnu. Or, just as it is common practice to honour a distinguished person in our society by placing a garland around their neck, Bhagavan is distinguished by this unique garland to indicate His Lordship and Superiority. Prof. A. Srinivasa Raghavan points out that the Vaijayanti is composed of the five precious gems – pearl, ruby, emerald, sapphire, and diamond. The writer in Dharma Chakram suggests that we should focus all our tan-matras to the service of Vishnu (he gives the example of Andal who decorated herself with the flower garland just to make sure it was good enough for Lord Ranganatha). Sri Parasara Bhattar says that He is Vaachaspati because it was He who propounded the knowledge of the Vedas through Srimad Matsya Purana. It is the power of expression in the Matsya Purana that reveals the Guna of Vaachaspati in Him. Sri Adi Sankara interprets this Nama and the next one – Udaaradhih, as one Nama. He explains ‘Vaacho Vidyaayaah patih Vaachaspatih; Sarvaarthavishayaa Dheeh Buddhih asya iti Udaaradheeh, Vaachaspati Rudaaradheeh iti ekam naama – He is the master of all knowledge, being of magnificent intellect.’ Thus it is one name combining two related attributes of Bhagavan. Sri Satyadevo Vasishtha explains the term Vaacaspati to signify that Bhagavan protects, or is the Master of, Vidya or Veda. 219. Udaara-dheeh – One with vast knowledge. ‘Dhee’ here means Buddhi or Intellect. Udaara means generous, noble, illustrious, etc. Udaaradheeh means One who has a generous disposition towards His devotees, or one who has an illustrious or magnificent intellect that can capture all things at all times. Swami ChinmayAnanda gives the interpretation that Bhagavan has a large-hearted tolerance to appreciate the weakness of His devotees’ heart, and espouses great sympathy and infinite kindness towards sinners in general. He has enough paternal kindness to overlook our trespasses, unlike the laws of physical nature which are blind and uncompromising. Bhagavan is the foremost amongst the best Gurus and hence He is Gurur Gurutamah. His abode or Dhaaama is the ultimate destination for his devotees. He is Satyah as He is the truth that his devotees seek and He is well disposed to his devotees. HE exemplifies true valour, so He is called Satya-paraakramah. He does not have to open his eyes to see the world, so He is Nimishah. He is Animishah as He is forever awake and watching all events. He is Sragvee as He is always adorned with the special garland (Vaijayanti) and He is Vaachaspatih, the Lord of Speech. He is Udaara-dheeh as He has vast knowledge and magnificent intellect. There are no limits for chanting Hari Nama. But generally if you are chanting Rama Nama, Hari Nama or Narayana Nama, it’s 108 times or 28 times or 10 times. Constant contemplation is ideal. Tremendous, tireless and selfless works. I am indebted to you for the same. May lord narayana bless you and family with all graceful blessings. Thank you Sethuraman ji! God bless you! Hari Om!!! Thank you Sir for such an awesome commentary. Hari Om! You are welcome Nirmalaji! God bless you! Hari Om! You are welcome. God bless you! Hari Om! Absolutely divine! I like the Nama on Dhaama where Sri Sankara interprets as the Supreme Leading Light. Narayana is the ultimate light’ & I also liked the Nama Sragvi’ We can never imagine the Lord without his Vyjayanthi Malai’ Superb story on Matsya Avathar too. Overall the rating is beyond compare. Thank you very much. Hari Om! Thank you 🙂 Great to see you delving deeper into it 🙂 God bless you! Hari Om! what a superb Shloka . nimishah and animishah in the same Shloka – essentially to note that opposites co exist ? Indeed Karthik. There are beautiful alliterations in many shlokas…and yes, he is both Viraat and miniscule, always awake and always in yoga nidra…in short he is Anirdesya-vapuh (Nama 179) and Ameyatma (Nama 181) – indescribable and immeasurable wonder! Hari Om!